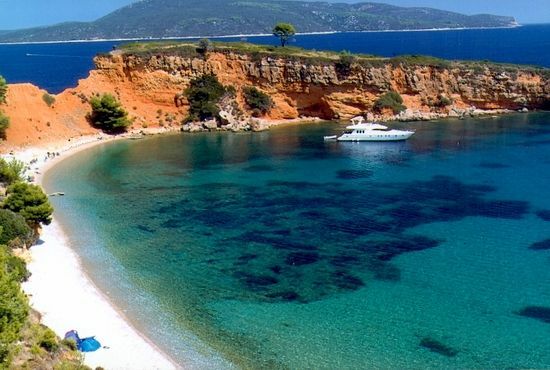 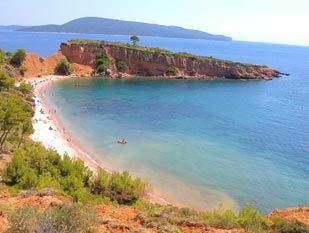 Kokkinokastro is one of the most impressive beaches of Alonissos thanks to its unique red colored rocks that surround it. 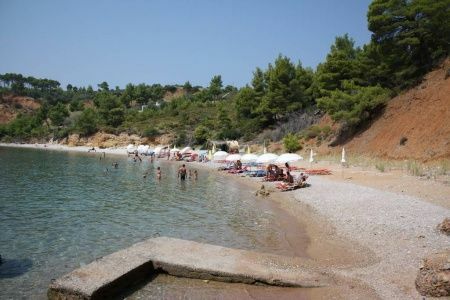 It is quite large and on the left half side umbrellas and sunbeds are available for rent. 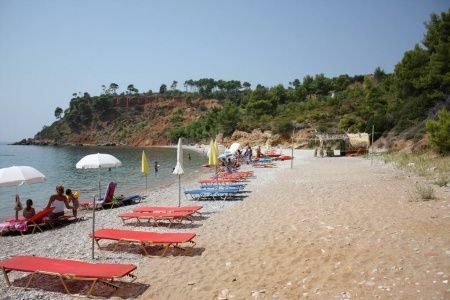 It is located in the southeastern coast between Chrisi Milia and Leftos Gialos (see separate listings) and is accessible by land via an asphalt road, where ample parking space is available. 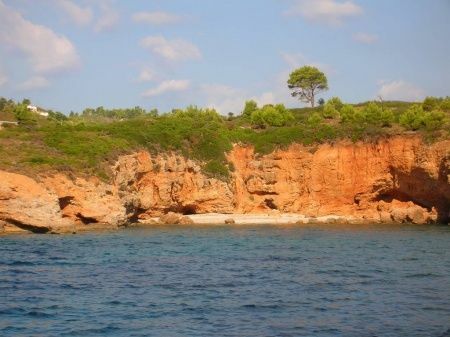 After the parking spot you will find a 30 meter long footpath which will lead you straight to the shore. 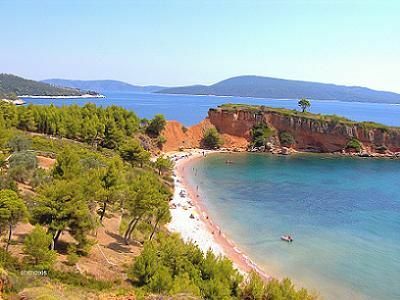 It has a small bar and canoes for rent and explore the numerous smaller beaches that surround Kokkinokastro or the old ruins of the Red Castle that was built in the area. 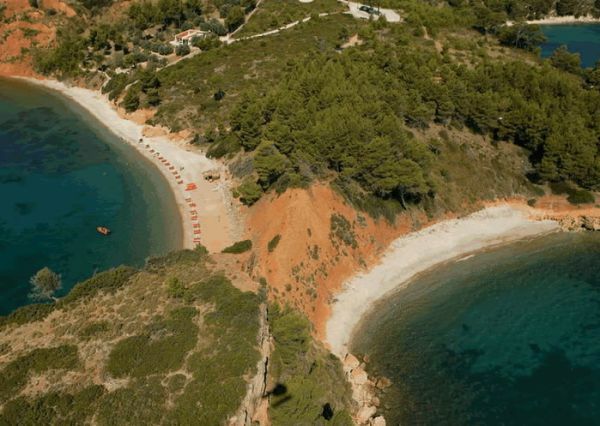 Moreover, Kokkinokastro is one of the most important archaeological sites since therein lies the old city of Ikos. 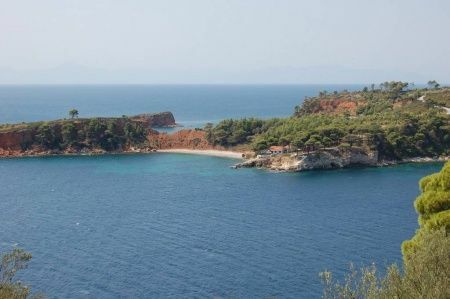 Unfortunately there have not been extensive digs or studies and the ruins of the Red Castle’s walls is the only visible remain of the ancient city of Ikos.It is also one of the most beautiful spots to snorkel and admire the natural beauty of our ocean.We recommend that one of the best times to visit the area is when the sun starts to set and the combination of the reddish sun light reflected on the red rocks of Kokkinokastro give you the ideal set up for pictures and relaxation.